Evan and I headed up to San Francisco today, and it was just perfect! We took the Caltrain, so we didn't have to worry about driving/parking. Once we got there, we needed food. After a quick Yelp consultation, we decided on Farmerbrown's Little Skillet. It's known for its chicken + waffles and soul food. 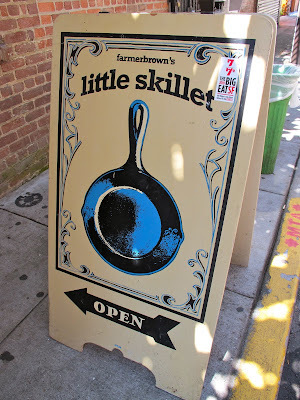 Farmerbrown's Little Skillet is located in an alley - you literally place your order at window and find a place to sit on the ground. I love off-the-beaten-path places like this! I ordered the biscuits with bacon, eggs and cheese. Yes, I eat meat...just not all the time. Bacon is mainly what's keeping me from being a full-fledged vegetarian. It gets me every time! Evan had the chicken + waffles and devoured it. I tried some, and it was pretty darn amazing. 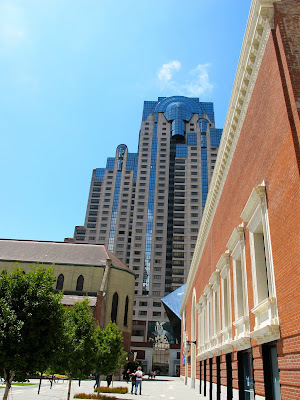 We then walked to the Ferry Building for some much-needed coffee! This was my first time trying Blue Bottle Coffee. It's definitely not Philz Coffee - but it was pretty darn delicious! We decided that some sort of frozen treat was in order, so we tried Icebee. Evan got a mixture of peanut butter yogurt, strawberry yogurt and cookies 'n cream + raspberries, Heath bar and crushed graham crackers. Green was my theme! Pistachio yogurt and tart green apple with kiwi, toasted coconut and white chocolate chips. Oh, yum!! We walked around for a bit before grabbing a beer at The Creamery. Fun fact: the woman who placed our order at Little Skillet also works at The Creamery. I was like, "Haven't we seen you today?!" She even remembered Evan's name! Gosh, I sure do love that man. We both got the Anchor Summer Beer - cheers!